Home |Exercise/Training|WHY DO I FEEL CONSTANT MUSCLE TIGHTNESS? A big issue with postural adaptation is the time factor. For instance, spinal muscles shorten and tighten within 20 minutes!!!! of not moving. Yes, I know! Each joint is surrounded by muscles that work in pairs. One set of muscle shortens and contracts. This means the opposing set of muscles have to lengthen and relax. 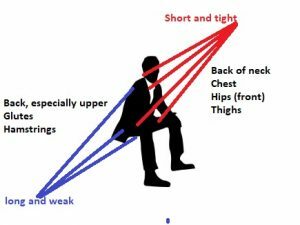 On a broader level, the muscles that act on the front of your body should be matched in strength and length by the muscles at the back of your body. For example, if you sit all day at a computer your shoulders are likely pulled forward creating a strength imbalance between the front of your body and the back. In the long run, muscle imbalances usually lead us into to pain and injury. Injury is not necessarily brought on by sport or activity, although we are of course more likely to injure ourselves during activities when we have severe muscle imbalances. However most common injuries to joints, muscles, tendons and ligaments are actually repeated strain injuries, or what is now called “occupational overuse”. SO WHAT CAN THE AVERAGE ADULT WITH LIMITED TIME DO? If you are using a gym, use predominantly free weights. These will add an element of balance and thus strengthen your core / postural muscles. Stay away from silly “ornamental” exercises such as bicep curls.They are a waste of time unless you want funny Popeye arms. Add elements of mobility and balance into everything you do. For instance: Could you add a lateral or backwards leg lift at the end of a squat? Could you add a rotation or a twist to some of your standing exercises? Play around with movement and try new activities. You will make your body more functional AND also have more fun! ← Previous Previous post: How valid is stretching as a warm-up? Next → Next post: What conditions is Acupuncture useful for?